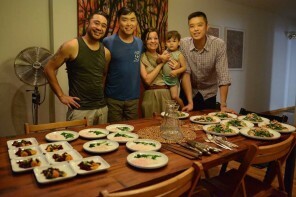 Hudson Yang with The Park's Finest co-owners Johneric Concordia and Christine Araquel-Concordia. "When they cast me as Eddie, they did it in part because in a lot of ways, we're alike. I mean, it's not just that we kind of look alike: We say what's on our minds and we do what we feel like we gotta do, and we both really love food." Editor’s Note: This is a guest post by Hudson Yang, who stars in Fresh Off the Boat, and has a new webseries, Taste Test with Hudson Yang, on ISAtv. 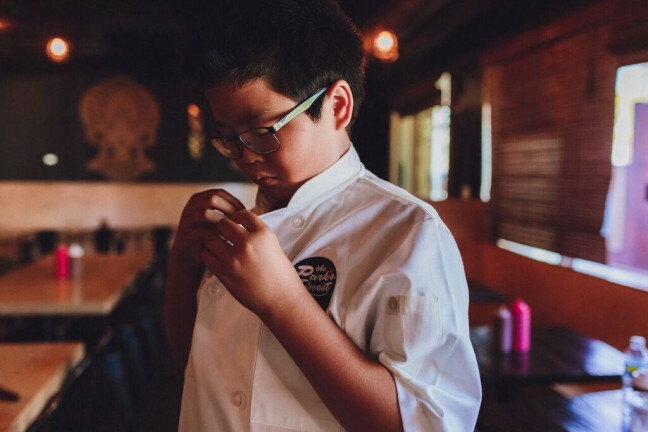 Below, he talks about being inspired by Eddie Huang, and how he went to cooking camp this summer to learn more about food. 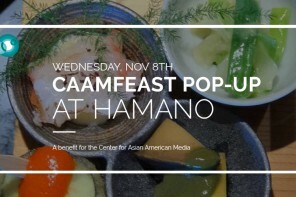 Hudson will be guest blogging at CAAM for the next two months and will share his thoughts on cooking, food and storytelling! Hey all, I’m Hudson Yang, and I play Eddie Huang on ABC’s Fresh Off the Boat. You probably know Eddie is based on the real Eddie Huang, who’s an amazing chef and writer — his restaurant Baohaus in NYC is the bomb, and he’s opening one in LA soon, yeaaahhhh. Eddie’s memoir about growing up as a Taiwanese American kid in Orlando, Florida turned into our show. When they cast me as Eddie, they did it in part because in a lot of ways, we’re alike. I mean, it’s not just that we kind of look alike: We say what’s on our minds and we do what we feel like we gotta do, and we both really love food. I always have, since I was a little kid. My grandma on my mom’s side, who lived with us, would cook all the time — it was her way to show that she loved us. I grew up on amazing Taiwanese food (and leftovers from the food, and leftovers from the leftovers….). She let me help her cook, showing me how to use a knife the right way to peel vegetables, stirring the pot. Once I got burned and my dad flipped out. But I told him it was my fault and that I’d be more careful. I kept on helping my grandma…and even when I got burned again, I pretended it didn’t happen so he wouldn’t know until it healed. Anyway, the real Eddie is still my inspiration. I’ve seen his shows on the Internet and he’s hilarious and he really knows how to make food into more than just something you eat — it’s something you live. I’ve said before in interviews that I want to open a restaurant when I grow up, and have a really experimental menu that will blow people’s minds. But if I’m going to do that I have to start learning now, the way Eddie did when he was a kid, helping out in his dad’s restaurant. I asked my dad to send me to cooking camp this summer, and I spent weeks learning how to make real meals from Chef Eric — all-day cooking. And then my dad’s friends at ISAtv offered to help make a web series for me that’s about learning about Asian food from all kinds of places — how to make it, and how to eat it. We came up with the name TASTE TEST WITH HUDSON YANG, and we’ve shot four episodes so far…and the first one debuted tonight, in which I hang out with the great gang at Los Angeles’s most amazing BBQ place, The Park’s Finest. 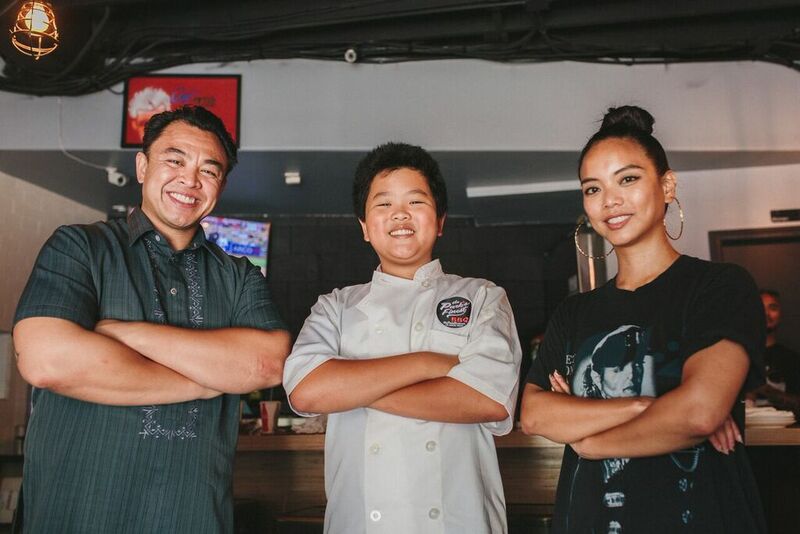 They use their Filipino roots to turn meat into magic. I can still taste it even as I’m writing this. The head smoke master Johneric is amazing — he’s full of stories about his family and the traditions of cooking, Pinoy style. His wife Christine is super-cool, she really knows how to run a business that makes people happy, and showed me what it’s like to be a good server…because food isn’t just putting stuff on a plate, it’s about getting people to enjoy their time together. You can watch the first episode of TASTE TEST below. I’ll keep on writing about my adventures in food land as each new episode comes out, so yo, don’t stop reading, and don’t stop eating!